ESCHATOLOGIA: What Will Be the Sign of the Son of Man in the Heavens Before His Coming? What Will Be the Sign of the Son of Man in the Heavens Before His Coming? "And then the sign of the Son of Man will appear in the heavens" (Matt. 24:30). "For in these very days of the holy feast of Pentecost on the Nones of May, about the third hour, a gigantic cross formed of light appeared in the sky above holy Golgotha stretching out as far as the holy Mount of Olives. It was not seen by just one or two but was most clearly displayed before the whole population of the city. Nor did it, as one might have supposed, pass away quickly like something imagined but was visible to sight above the earth for some hours, while it sparkled with a light above the sun's rays. 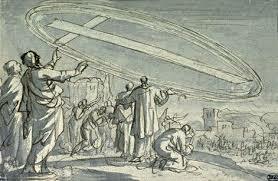 Of a surety, it would have been overcome and hidden by them, had it not exhibited to those who saw it a brilliance more powerful than the sun, so that the whole population of the city made a sudden concerted rush into the Martyrium [the church] seized by a fear that mingled with joy at the heavenly vision. They poured in, young and old, men and women of every age, not only Christians but pagans from elsewhere sojourning in Jerusalem, all of them as with one mouth raised a hymn of praise to the worker of wonders, Christ Jesus our Lord, the Only-begotten Son of God and indeed attested to through experience, came to discern that the honorable Christian teaching is to be found not only in 'persuasive words of wisdom, but with a demonstration of Spirit and power' (I Cor. 2:4), and not only preached by man but, witnessed by God from Heaven. 'Announced originally through the Lord, it was confirmed for us by those who had heard. God added His testimony by signs, wonders, and various acts of power' (Heb. 2:3-4). We consider it our obligation not to remain silent about this Heavenly vision, but through this letter, hasten to inform Your God-glorified and Pious One." O my brethren, everything is possible with God: both, to reveal the created to man and to create the uncreated. But most importantly for us is that He wants to redeem our souls from sin and death and to give us life eternal. Let us pray to Him for this day and night. O Lord Almighty, To Thee be glory and praise forever. Amen.